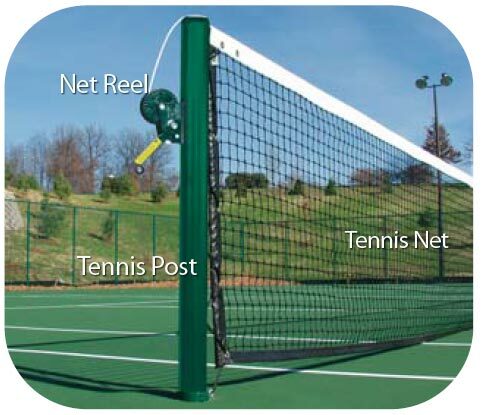 Bluegrass Playgrounds offers tennis playground equipment including tennis net accessories, official tennis post, tennis net reel, tennis nets, tennis ground socket, net fittings, classic round tennis posts, tennis net posts, tennis nets and court accessories, tennis nuts, tennis nets centre nuts and post winders. Net reel and net fittings included; meets USLTA Standards; Ships UPS. 3 mm double braid polyethylene netting 42' long; 1st rows double netting; 2.5" double reinforced headband; 8 rows nylon stiching; 6 mm vinyl coated steel cable, Tape nylon bottom and dowels. Ships UPS. Solid support; quick removal for all game standards. 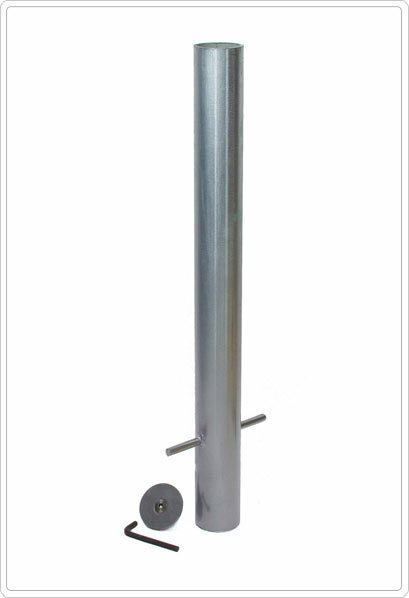 Supplied with neoprene seal safety cap, wrench and limit pin, creating a 6" debris trap; Ships UPS. Bluegrass Playgrounds equipment offers discounted sports equipment accessories for basketball, soccer, football, baseball, tennis, volleyball, game standards and golf furnishings.